CCS Skateboards catalogs and skateboarding online shops have everything you need for the perfect ride, from skateboarding videos and DVD's to the best boards! Skateboards - Go with a pre-made or custom board from the companies who know what skateboarding is all about, like Baker skateboards, Flip skateboards, Element skateboards, Alien Workshop skateboards, Habitat, CCS and Zero skateboards. Skateboard videos - From beginners just learning how to skateboard to pros looking for new skateboarding tricks on extreme skateboarding videos and DVD's, their skateboard video collection will help your ride and provide you with a look at some of the best skateboarders out there today. Skate shoes - Your shoes can make or break your ride, CCS Skateboards carries only the best skater shoes from Es shoes, Adio shoes, Nike, Emerica, Lakai, DVS shoes, DC skateboarding shoes, and more. 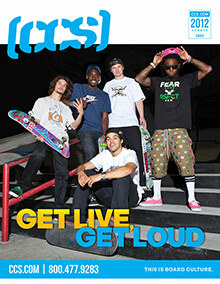 Hot new skateboarding clothing - Board in comfort and style with the hottest looks in skater wear. Who needs the other skateboard shops when CCS Skateboards carries the logo t's, pants, jackets, sweats and hats you want? Shop the best of Element, Volcom, Plan B and over a dozen other skater brands. Parts and accessories - Build your own or repair your board with new skateboard decks, trucks and other skateboard parts from their internet and print catalog skateboard shops. Order your free skateboarding catalog, and check out all their new skateboards, accessories and extreme skateboarding videos. Whether you shop their online or catalog skateboard shops, you'll have a better ride with the equipment from CCS Skateboards.